Mark Thoma had this up on Facebook. and pulled this from Tim Taylor’s Conversable Economist. It is an interesting read. What was the key insight or argument in Friedman’s 1968 address? Friedman offers a reminder that interest rates and unemployment rates are set by economic forces. Friedman uses this idea to build a distinction between the long-run and the short-run. In the short run, it is possible for a central bank like the Federal Reserve to influence interest rates and the unemployment rate. In the long run, there is a “natural” rate of interest and a “natural” rate of unemployment which is trying to emerge, gradually, over time from all the various forces in the economy. The rest you can read for yourself at Tim’s site. 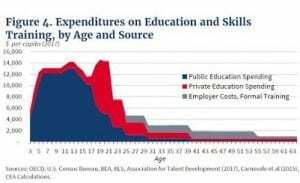 Conversable Economist Tim Taylor presents a chart representing spending over a life time on Education and Skills in America. “Figure 4 (depicted) is from a report by the White House Council of Economic Advisers, titled “Addressing America’s Reskilling Challenge” (July 2018). The blue area shows public education spending, which is high during K-12 years, but the average spending per person drops off during college years. After all, many people don’t attend college, and of those who do many don’t attend a public college. Private education spending shown by the red area takes off during college years, and then trails off through the 20s and 30s of an average person. By about age 40, public and private spending on education and skills training is very low. Spending on formal training by employers, shown by the gray area, does continue through most of the work-life.